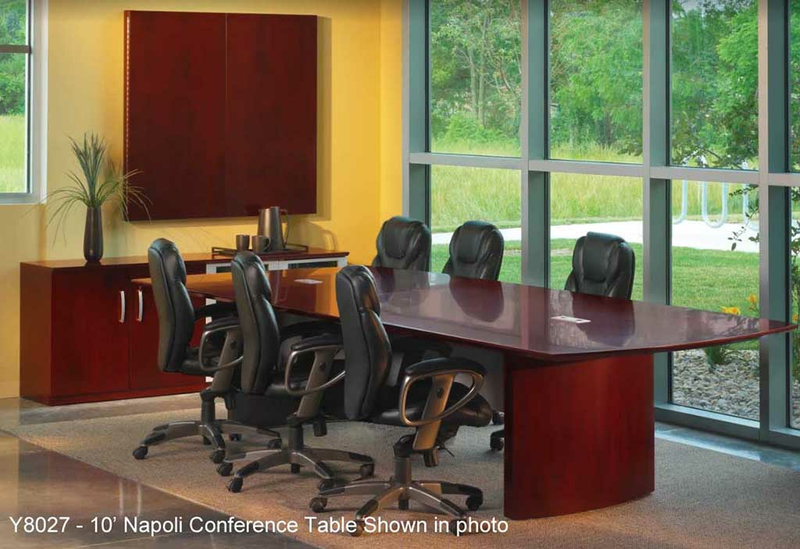 Napoli Conference Tables combine ultra-modern styling cues with the classic sophistication of genuine wood veneer. 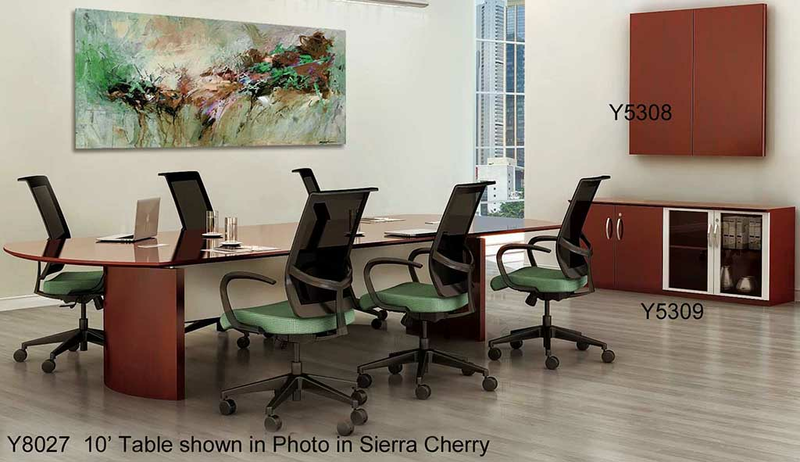 Perfect for the casual or executive conference room! 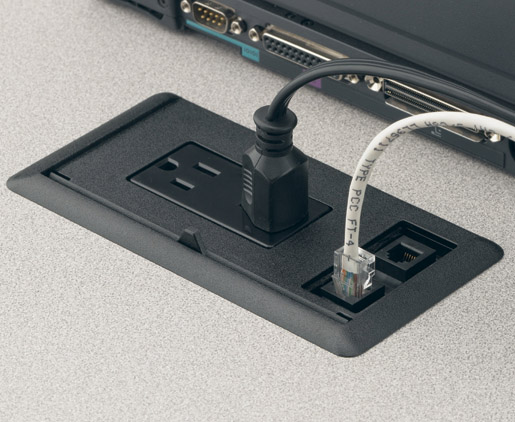 Technology-friendly design allows you to easily integrate power and hide cords in the bases of the table. Choose from sizes from 6' up to 30', in two stunning finishes. Tables ship quickly and arrive to your office in days! 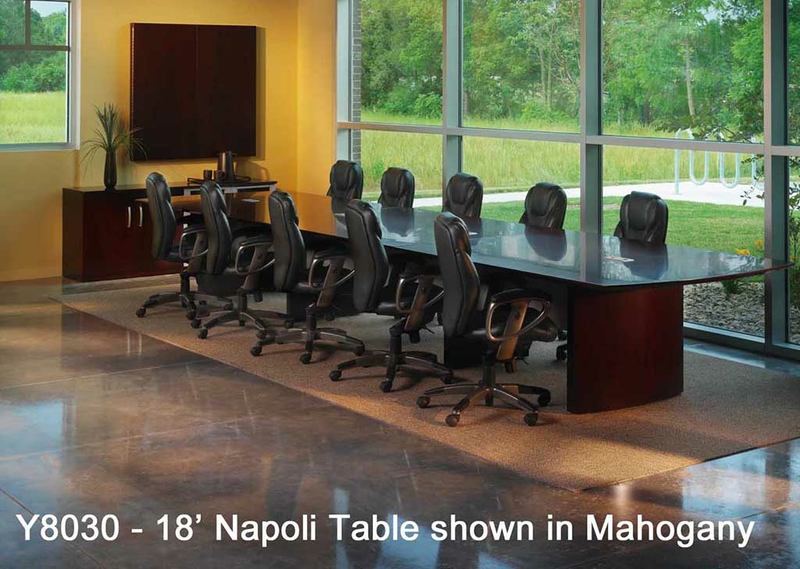 6' Napoli Table sold above. See other sizes below. 6' Napoli Table includes one centered grommet for wire management. Measures 72"W x 36"D x 29-1/2"H overall. Seats 4-6 people. Shpg. wt. 197 lbs. Ships unassembled. PRICE INCLUDES SHIPPING! (Truck shipment - see Terms & Conditions). * Table tops 'float' on nickel posts for a high end look! 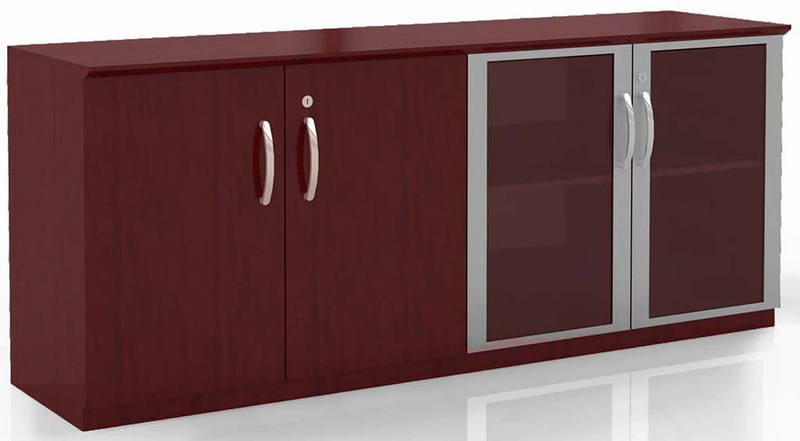 * Constructed of real wood veneers: Cherry veneer with Sierra Cherry stain or Walnut veneer with Mahogany stain. * Table tops feature a unique 'curved rectangular' design. Long sides of table are straight, the short ends are bowed. * Table support panels feature a silver laminate for contrast. 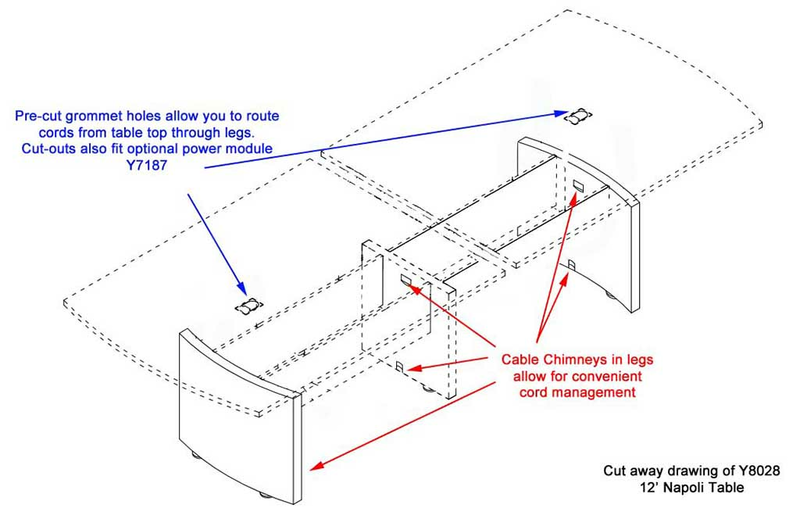 * Curved table bases include cable chimneys to keep cords organized and hidden from view. * All tables include built-in grommets for routing cords. Grommets also accept the Y7187 Optional Power Module sold below. 8' Table features a one-piece table top for a seamless look. Includes two built-in grommets. Seats 6-8 people. Measures 96"W x 42"D x 29-1/2"H overall. Shpg. wt. 236 lbs. Ships unassembled. PRICE INCLUDES SHIPPING! (Truck shipment - see Terms & Conditions). 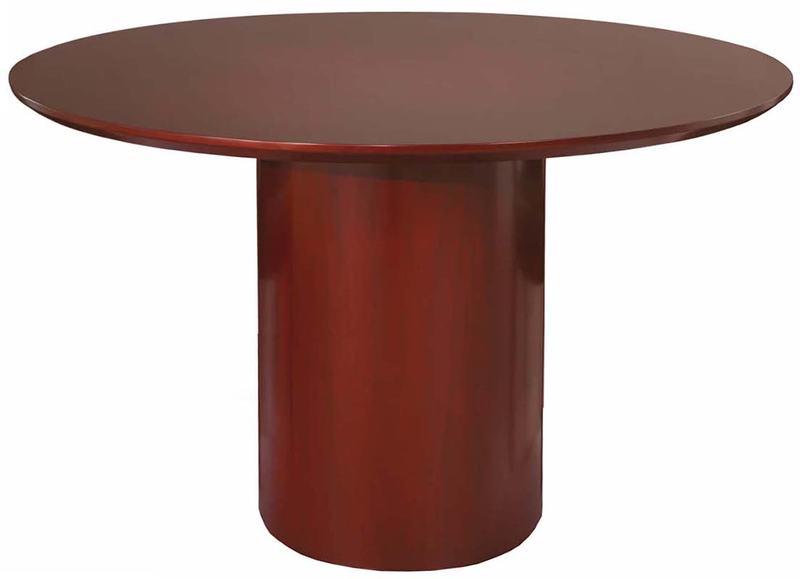 10' Table features a two-piece table top and two bases. Includes two built-in grommets. Seats 8-10 people. Measures 120"W x 48"D x 29-1/2"H overall. Shpg. wt. 306 lbs. Ships unassembled. PRICE INCLUDES SHIPPING! (Truck shipment - see Terms & Conditions). 12' Table features a two-piece table top and three bases. Includes two built-in grommets. Seats 10-12 people. Measures 144"W x 54"D x 29-1/2"H overall. Shpg. wt. 358 lbs. Ships unassembled. PRICE INCLUDES SHIPPING! (Truck shipment - see Terms & Conditions). 14' Table features a two-piece table top and three bases. Includes two built-in grommets. Seats 12-14 people. Measures 168"W x 54"D x 29-1/2"H overall. Shpg. wt. 399 lbs. Ships unassembled. PRICE INCLUDES SHIPPING! (Truck shipment - see Terms & Conditions). 18' Table features a three-piece table top and four bases. Includes four built-in grommets. Seats 16-18 people. Measures 216"W x 54"D x 29-1/2"H overall. Shpg. wt. 545 lbs. Ships unassembled. PRICE INCLUDES SHIPPING! (Truck shipment - see Terms & Conditions). 20' Table features a three-piece table top and four bases. Includes four built-in grommets. Seats 18-20 people. Measures 240"W x 54"D x 29-1/2"H overall. Shpg. wt. 585 lbs. Ships unassembled. PRICE INCLUDES SHIPPING! (Truck shipment - see Terms & Conditions). 24' Table features a four-piece table top and five bases. Includes six built-in grommets. Seats 22-24 people. Measures 288"W x 54"D x 29-1/2"H overall. Shpg. wt. 732 lbs. Ships unassembled. PRICE INCLUDES SHIPPING! (Truck shipment - see Terms & Conditions). 26' Table features a four-piece table top and five bases. Includes six built-in grommets. Seats 24-26 people. Measures 312"W x 54"D x 29-1/2"H overall. Shpg. wt. 772 lbs. Ships unassembled. PRICE INCLUDES SHIPPING! (Truck shipment - see Terms & Conditions). 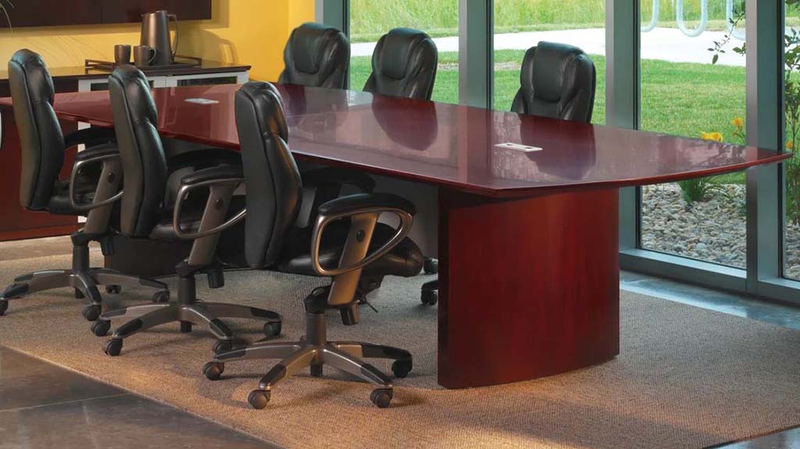 30' Table features a five-piece table top and six bases. Includes eight built-in grommets. Seats 28-30 people. Measures 360"W x 54"D x 29-1/2"H overall. Shpg. wt. 919 lbs. Ships unassembled. PRICE INCLUDES SHIPPING! (Truck shipment - see Terms & Conditions). Features round drum base. Seats up to 4 people. Measures 48" Round x 29-1/2"H overall. Shpg. wt. 135 lbs. Ships unassembled. PRICE INCLUDES SHIPPING! (Truck shipment - see Terms & Conditions). 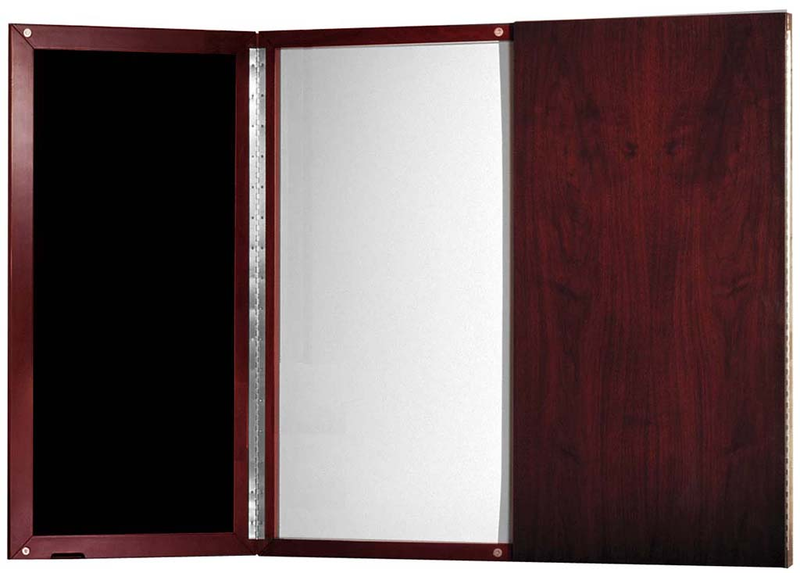 Wood veneer doors house a 45" x 45" white markerboard with a magnetic, non-ghosting surface. Black fabric tackboards are on door interiors. Sculpted lower tray holds markers and erasers. Measures 48"W x 48"H x 3-1/4"H overall when doors are closed. Ships fully assembled! Shpg. weight 110 lbs. PRICE INCLUDES SHIPPING! (Truck shipment - see Terms & Conditions). Choose from 3 door styles: all wood doors, all clear glass doors or combination wood/glass (like shown in picture). 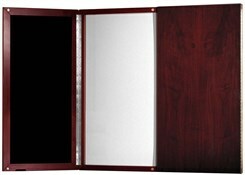 Both sets of doors include one adjustable shelf and locks for doors. Measures 72"W x 19"D x 29-1/2"H overall. Shpg. wt. 193 lbs. Ships unassembled. PRICE INCLUDES SHIPPING! (Truck shipment - see Terms & Conditions).